At the end of 2018, UNODC completed its fourth edition of the General Assembly-mandated UNODC Global Report on Trafficking in Persons. Over the past 10-15 years, trafficking patterns and flows have evolved in many ways. Readers can find the latest human trafficking trends at regional and global levels in the 2018 edition. Researchers can also look at the different editions of the Global Report to see how the quality of trafficking data and research has evolved in the recent past. 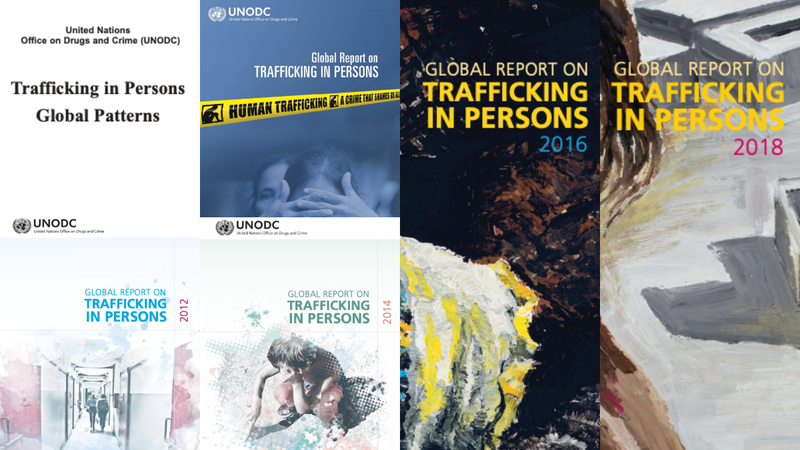 One “ancestor” of the Global Report is the Trafficking in Persons; Global Patterns report, published by UNODC in April 2006 and based on open-source information. A research team collected thousands of accounts of trafficking in persons published in official reports, academic studies and the media. As noted in the preface to this study, the reason behind this methodological approach was due “only in part to the hidden nature of the crime. The lack of systematic reporting by authorities [was] the real problem”. In 2009, under the auspices of the UN.GIFT, UNODC published a new global study on human trafficking. This report included global and regional statistics on trafficking in persons for about 155 countries and territories around the world. The data collection effort was quite intense, with 25 researchers across all UNODC Regional Offices and headquarters. For 18 months, this team was dedicated to gathering information on cases of trafficking in persons that were officially recorded by national authorities. Some of these researchers even went in person to collect the files from the courts’ registries or from victims’ shelters. Both the 2006 and 2009 publications assessed the lack of solid data on trafficking in persons. At the same time, estimates of the supposed global magnitude of the phenomenon proliferated, ranging from 500,000 to 4 million victims of trafficking. Often, however, methodology and operational definitions to draw these estimates were not reported. As a consequence more information was available on the hidden size of the phenomenon than on the officially recorded part of it—something quite unique in the history of social science. Whatever the opinion one had about that kind of information, at the end of 2009, the profile of trafficking victims and offenders officially recorded at national and international levels was unknown. To fill this gap, when in 2010 the United Nations Global Plan of Action to Combat Trafficking in Persons mandated UNODC to publish the Global Report, we decided to start an annual and global data collection effort of officially detected trafficking cases. Over the past eight years, UNODC has collected information on about 225,000 victims officially detected by national authorities worldwide since 2003. In 2016 alone, about 100 countries provided reports to UNODC about 26,000 victims of trafficking. This was the result of the overall improvement of national authorities’ capacities to collect data on trafficking in persons. In 2009, only 26 countries had a coordinating institution that systematically collected and disseminated data on trafficking cases. By 2018, the number had risen to 65. Over the years, the development of data collection standards has been considered by the international community as a key activity to enhance national responses to trafficking in persons. In response, a series of initiatives focused on improving data collection were carried out by different international actors including the European Union, the International Organization for Migration, the International Labour Organization , the International Centre for Migration Policy Development, among others. At the time of writing, I am returning from a capacity building mission in North Africa, where local authorities were eager to receive tools to systematically collect and report their statistics on the cases of trafficking they detect, witnessing how data has nowadays turned into a matter of relevance. More data means more analysis, and every edition of the Global Report contains some small analytical advancement compared to the previous edition. The 2012 edition, for instance, included the first linear regression on trafficking data. The analysis presented the link between economic dynamics and trafficking flows, and the results showed that impoverished socio-economic conditions result in an increasing number of victims of trafficking. The 2014 edition of the Report presented multilinear regressions on time series data, explaining cross-border trafficking flows in terms of the gravity model of migration. The 2016 and 2018 editions presented qualitative analyses for more than 200 trafficking cases. Official statistics can only speak to part of the story, and those numbers, if not carefully presented, may mislead readers or analysts. It is not only a matter of collecting solid data from clear sources, but also how to use the data in a proper way. Evidence-based analysis, however, must start from this basis to evolve into something more adequate to describe the phenomenon of trafficking in persons. It is still not clear what that something could be. More recently, UNODC engaged with ILO and other UN agencies to test victimization surveys and multiple system estimates. This is much needed, and the analysis for the 2020 UNODC Global Report will probably combine official statistics with what will emerge from these innovative approaches. It is also imaginable, and desirable, that future research will drop the use of official statistics to study this crime. On trafficking data, however, the future is not here yet. Fabrizio Sarrica is a research officer for the United Nations on Drugs and Crime. He is currently serving as Team Leader for the UNODC research on Trafficking in Persons and Smuggling of Migrants. He is the co-author of five UNODC Global Reports on Trafficking in Persons (2009, 2012, 2014, 2016 and 2018), as well as leading the production of the UNODC Global Study on Smuggling of Migrants. The views expressed in this article are those of the author and do not necessarily reflect the views of the Secretariat of the United Nations. This article has been prepared by Fabrizio Sarrica as a contributor to Delta 8.7. As provided for in the Terms and Conditions of Use of Delta 8.7, the opinions expressed in this article are those of the author and do not necessarily reflect those of UNU or its partners.